Thousands of locals and travelers to Bangor, Maine agree that Geaghan’s Pub & Craft Brewery are as close as you can get to a “home away from home.” While you are there, try one of their craft beers, brewed on site! Fine food and beverages are amply supplied by Geaghan’s congenial and efficient staff. 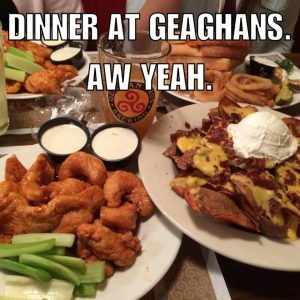 The Old Irish adage, “Laughter is brightest where food is best,” was never truer than at Geaghan’s Pub & Craft Brewery. First time guests, as well as long standing patrons, feel right at home. The menu is varied and features freshly baked breads, soups and stews that are made from scratch, and specialties ranging from fresh seafood and prime rib to Irish nachos and boneless Buffalo wings. If you are looking to leave the facility for dinner there are many restaurants in walking distance that vary in cuisine and price range. The front desk staff is more than happy to provide you with recommendations and directions. Offers fine foods and craft beer served up with a smile in the heart of bustling Bangor, Maine. Offering Japanese, Thai & Vietnamese dishes & sushi, plus a full bar. Offering delicious and remarkable food and drinks that meets the highest standards of quality & freshness combined with current and time-honored styles of cooking. Enjoy their restaurant, lounge and downstairs function space.